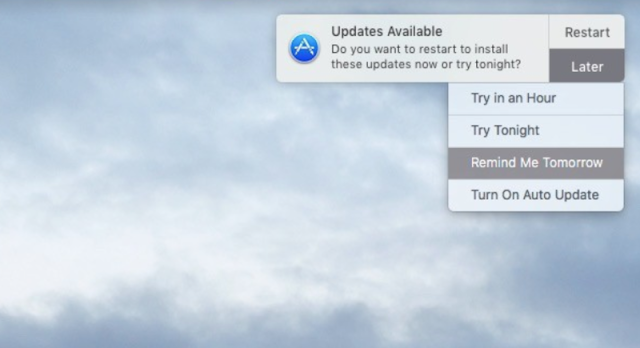 Imagine you could get your mac up to date without the annoying mac os update notifications. If your updates are installed in the background automatically without showing up annoying updates means you can stick with your work without any disturbance. It is beneficial for you, and even you can work flawlessly. Usually, these software updates are useful for any device, and they are essential. It is because they can bring brand new abilities and features to your device and helps to safeguard your system. In general, these updates are quite frequent for any modern devices. But, If you are mac computer users means you will probably feel frustrated and sick with all those annoying update notifications which show up every day on your computer screens. Usually, people don't have a problem with updating their computer, but their main problem is all about the frustrating notification which appears at the right time -- when you usually arrive at your work hours or when you have week worths work to complete in few days or at the first thing in the morning, etc. These situations are quite annoying, and people complain about these most often. Even if you update your computer today, there will be another update waiting for your tomorrow. So, if you want to get rid of these annoying mac os updates means, merely follow this post. In this post, you will find about how to install updates with getting any annoying mac os notifications. You can even see the solution for updates notifications which you can dismiss or remind me later as well. Before going to the article how to get rid of annoying mac os update notifications. You have to think about the updates process as well. Usually, these updates can fix all the security issues and resolve bugs in your system. In this post, I’ll show you all the three options, and you have to choose the best option which you want to try? Usually, stopping the mac os update notifications is quite easy. I’d instead suggest you skip this method because in this method you’ll skip updates and notifications. But, that is genuinely your call, and you can do as you wish. If you want to ignore all of the Apple’s Mac OS updates means you can simply use this option. This option opens up the vulnerabilities of your system, and it could be open for the attackers. Then click on the App store settings. After clicking on that, a box will appear on your screen. That's it with this process you can quickly stop seeing updates. But if you really want to install updates without showing any annoying notifications means, follow the next process. If you want to improve your computer health and want to keep your computer updated means you have to use this method. In this method, you keep your system update but you I’ll get rid of annoying updates. Firstly open the system preferences on your Mac. After that click on “ Install macOS updates” in newer versions. If you are using an older version means click on “ Install OS x Updates. In this way, you can quickly install updates without getting notified. That's why this is one of the best ways to get rid of annoying notification updates. If you want to safeguard your mac with security updates means you can install only security updates other than installing Mac Os Updates. It is still possible if you want me to show that process means, have a look at below method. Head over to the system preferences. Then open your Mac’s App store settings. It will have four options now deselect the “ Install Mac OS Updates. Then you can deselect the install app updates. After that "deselect download newly available updates" in the background. Make sure you only check in the install system data files and security updates option only. This process will install all the data files and security updates, but it will not install significant OS updates until and unless you update them by selecting Mac > Software Update. Now if you want to disable high sierra notifications means you can do that. Usually, all of the above notifications are easier to manage, but the new major operating system upgrades High Sierra, is the Apple’s latest big update and it is a sophisticated update which comes with a notification that's always harder to dismiss it manually. In this notifications, you will only have two options one is "install," and another one is "details" so there is no way to skip the notifications. So, to these harder changes, we have come up with a solution. The first one is a simple process -- here all you have to do is launch the mac app store. Then click on the updates. After that, you will see a big banner for the high sierra at the top of the page. Right, Click, anywhere on the image and select the hide update button which pops up. If the above process doesn't work, then you can use this method. Then type “/Library/Bundles” in the dialogue box. All you have to do is delete or move the file somewhere on your computer. While doing this, it will ask your computer password. You have to enter the password and allow your computer to restart. Once it is restarted means, you will be free from high sierra update notifications as well. These are the two different ways to get rid of notifications. This last high sierra second process was learned from Make Use Of article. You can find more details on that post regarding high sierra.